This game might be the oldest game in my collection so far. It is a small game (20.2 x 16.4 cms) printed on thick paper. I found it with four other similar games (see below) that probably surely to the same collection. As you can see, there is a perforation on the upper side of the game, which indicates these games were released as a booklet. There isn't any indication of the maker or the year the games were made on any of them, so I just can guess the age by a couple of facts. 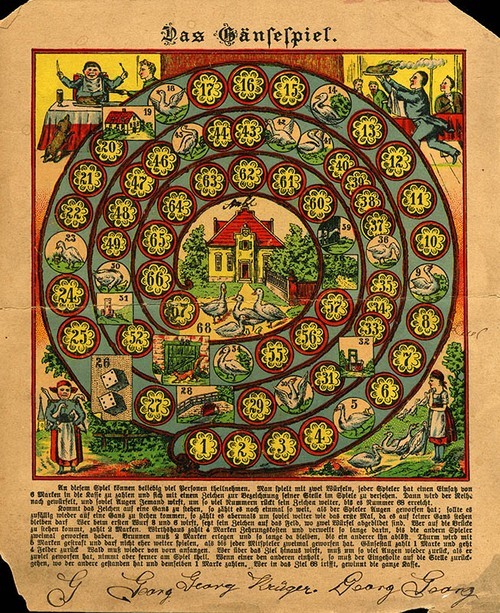 The first is that this is not a reproduction of an older board. When you have it in your hands you feel that the game is over 100 years old. 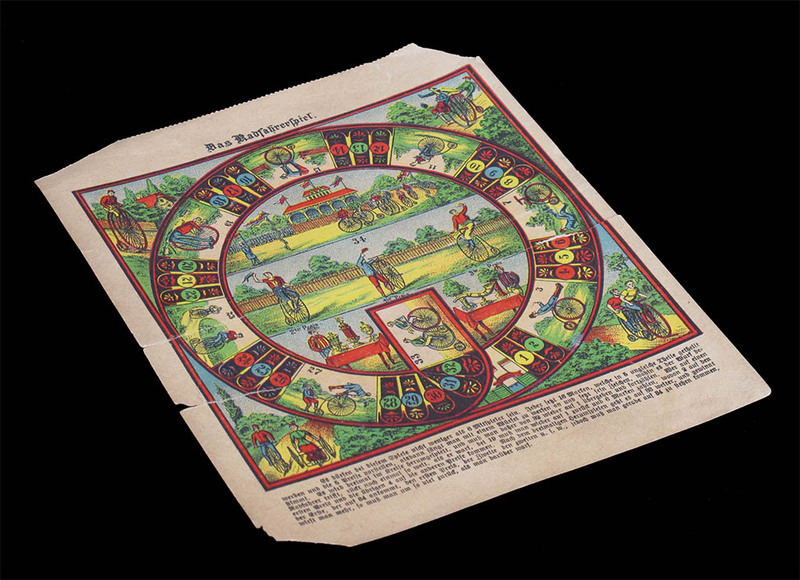 It looks older, for instance, than the small version of the otherwise quite similar game Die Rad-Wettfahrt. 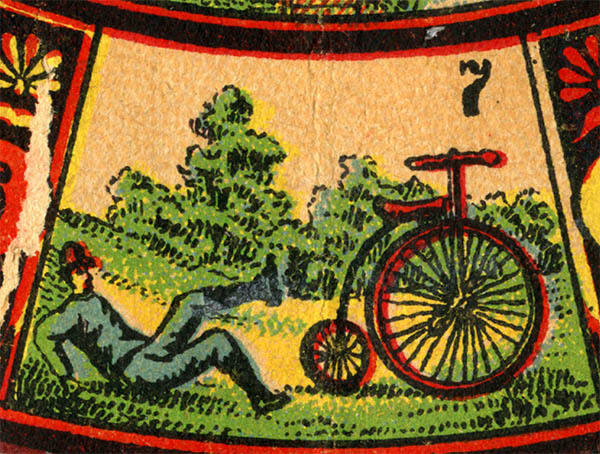 The second fact is that the illustrations of this game feature only High Wheelers and these were progressively replaced by the then called "safety bikes" in the late 1880s. 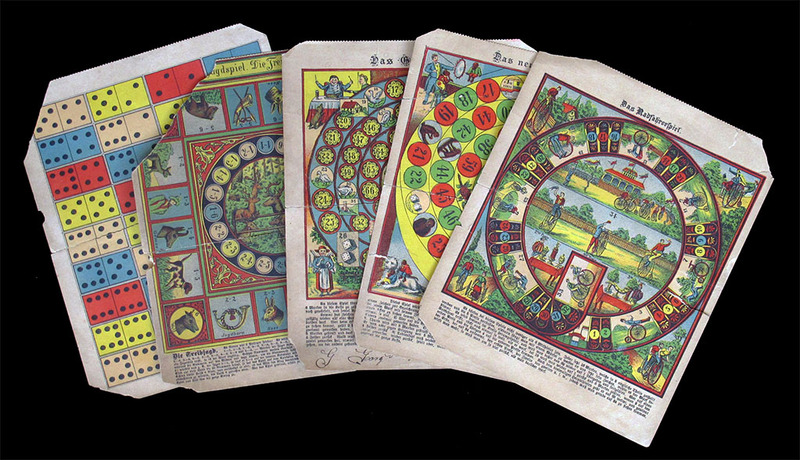 The rules of the game are hard to read for modern readers since they are printed in the Fraktur type, which can be quite confusing if you are not used to it. (Of course, the fact that my German is rather poor does not help much). 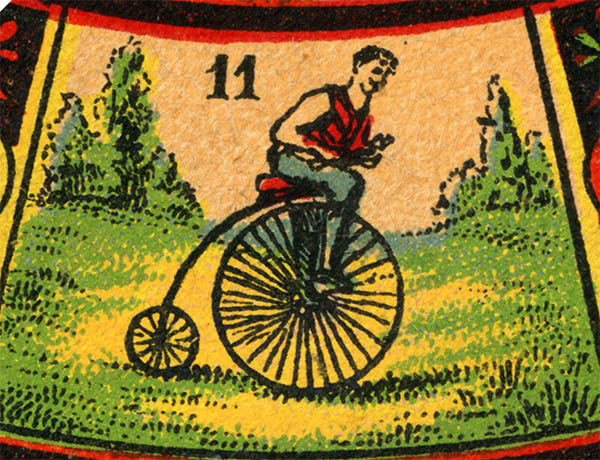 However, this does not give an indication about the age of the game since the Fraktur type was used until WWII. 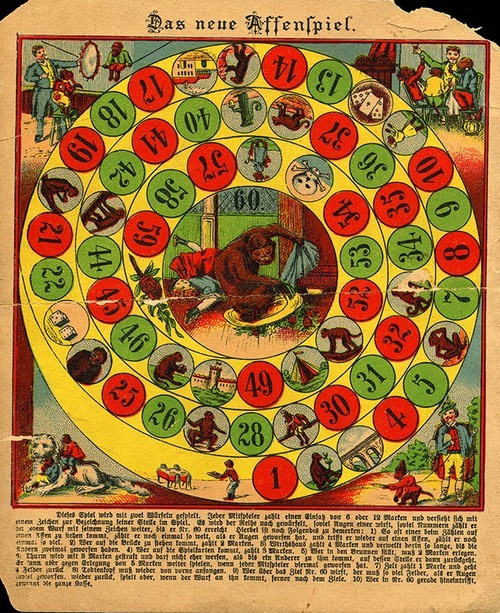 a) The game has to be played by a minimum of six players. Each player puts 16 marks as prize money. The total will be distributed unevenly (no more precisions given) between five prizes for the first five players to end the game. 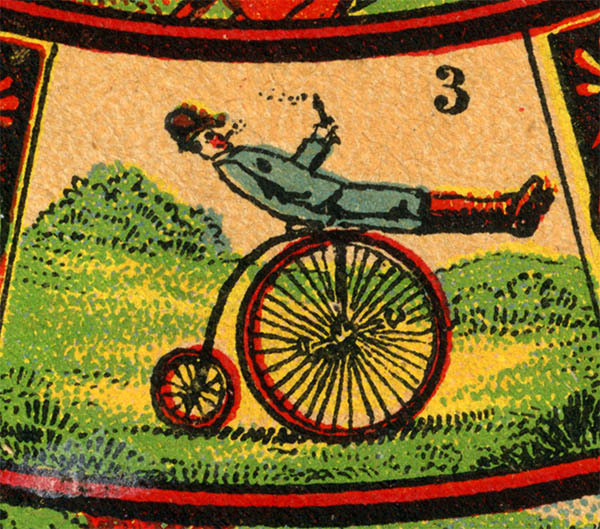 b) The players have to complete three laps to the 32-field circular track and only then may attemp to reach the final square, number 34, which only may be reached by an exact throw or else will go backwards some squares, as in most games of goose. 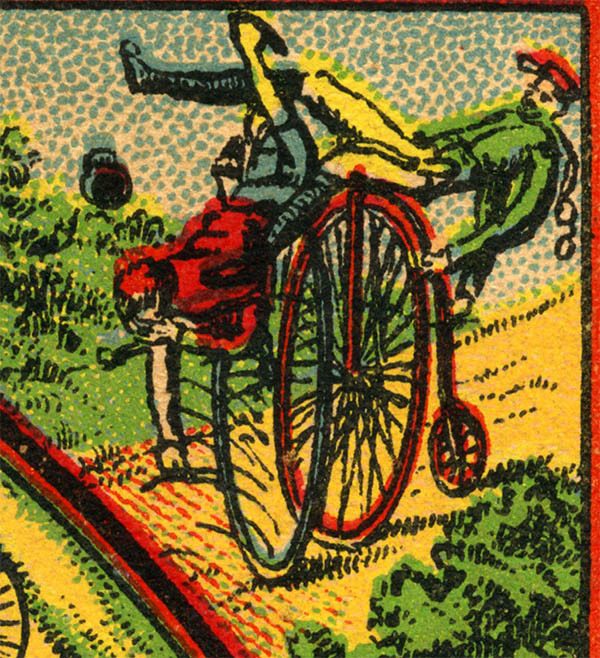 c) Whenever a rider falls on another cyclist, the rider moves again by the same distance (doubles his initial throw). d) The only special square is number 19. 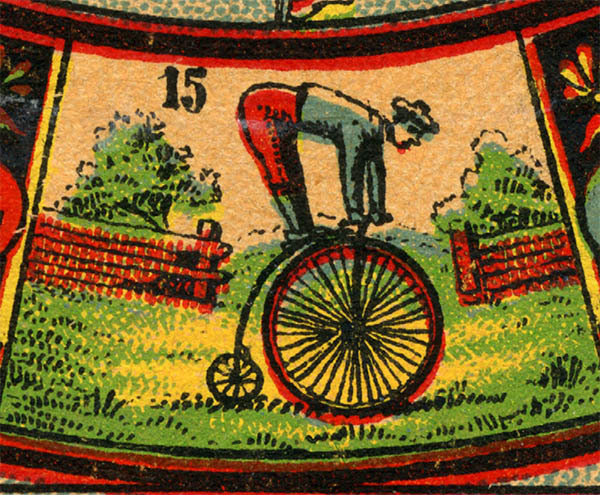 Cyclists who fall on it go back to square one and pay a six marks, two of which are added to the first prize and the rest to the other prizes. With these I think (*) you can play the game. Scroll to the bottom of the page to download the board. (*) Please email me if you detect errors in my translation. 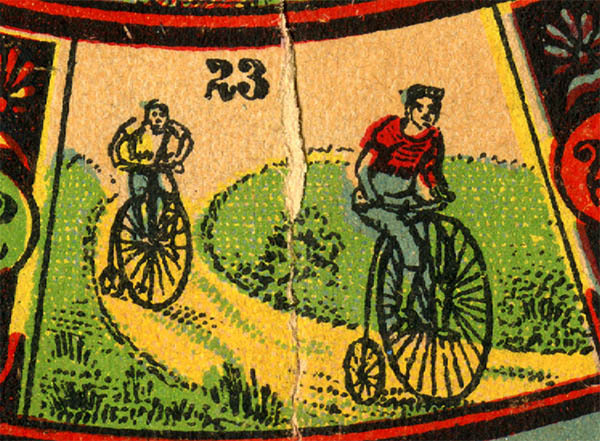 I said above that all the velocipedes depicted in the game are of the high-wheel type, but there is an exception. 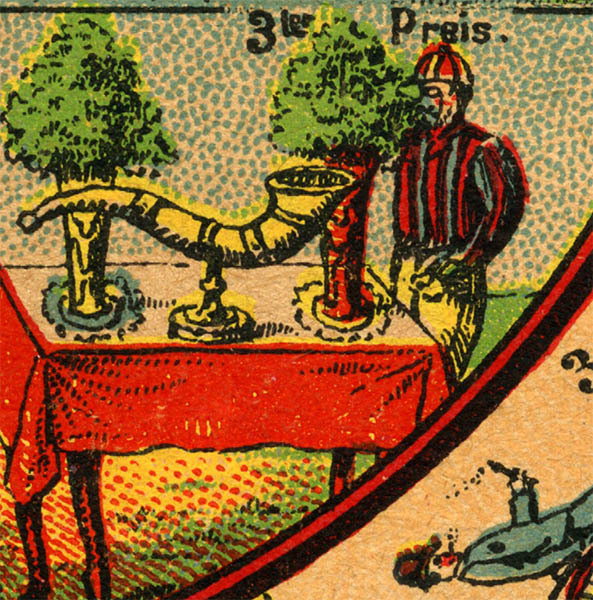 The lady on the bottom right corner of the board rides a tricyle. 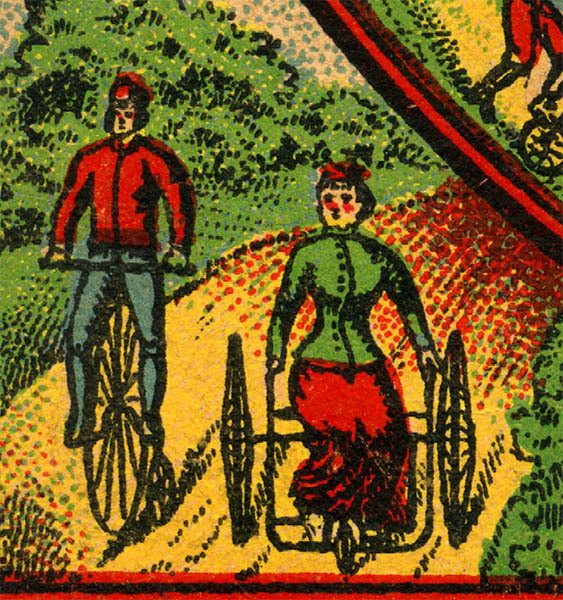 A 1880s tricycle, by the way. 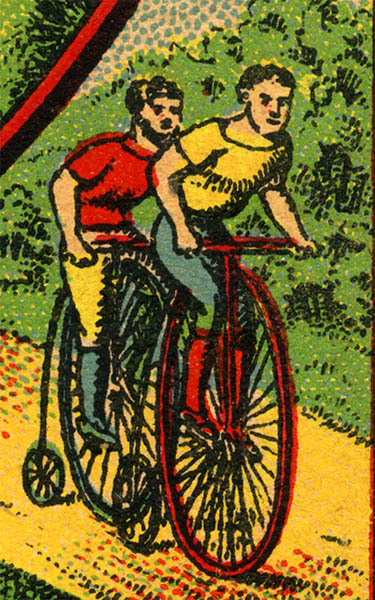 According to Charles Terront's memories, the change from high wheelers to modern bicycles, at least for professional cyclist, was in 1888-1889. 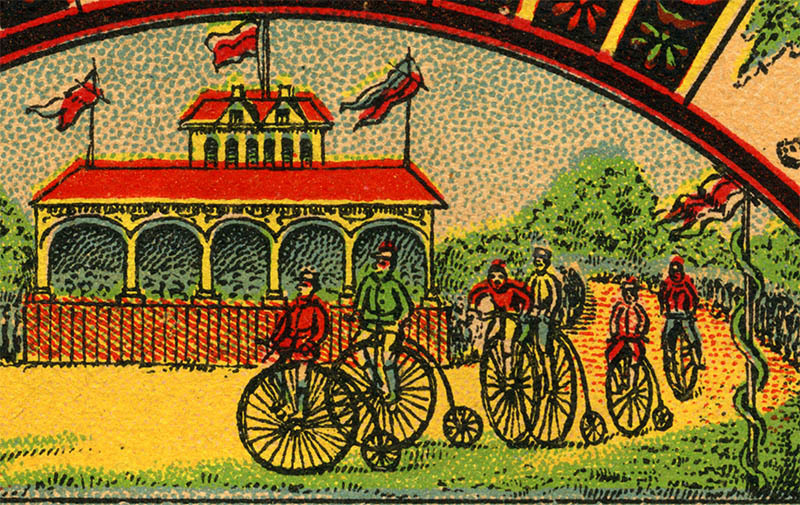 Charles Terront himsef was quite conservative about it and rode high wheelers as long as possible. 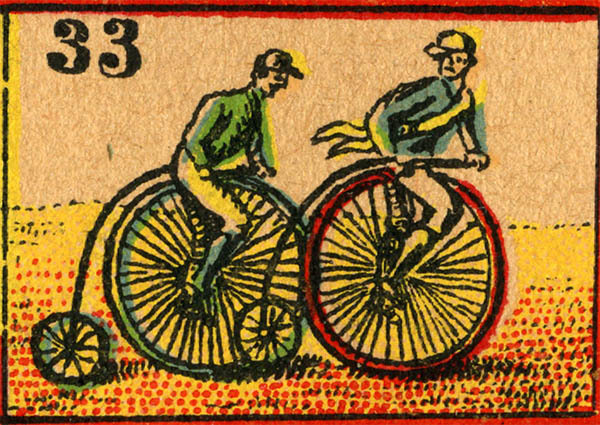 In 1888 he won the 100 kms French Championship on a high wheeler while his competitors already rode modern bikes. 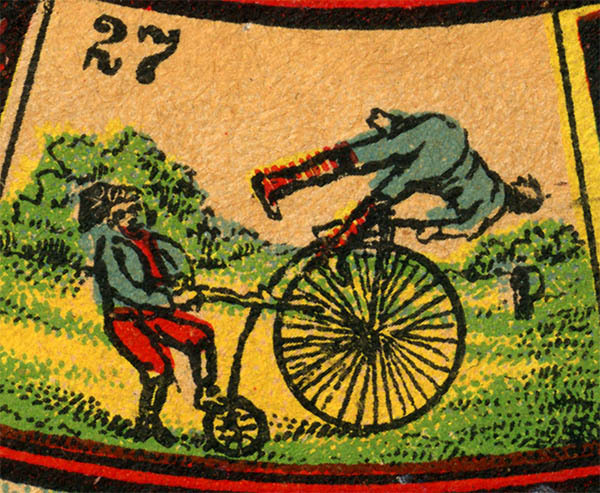 In 1889 he won this title again, but by then he was riding a modern bicycle himself. 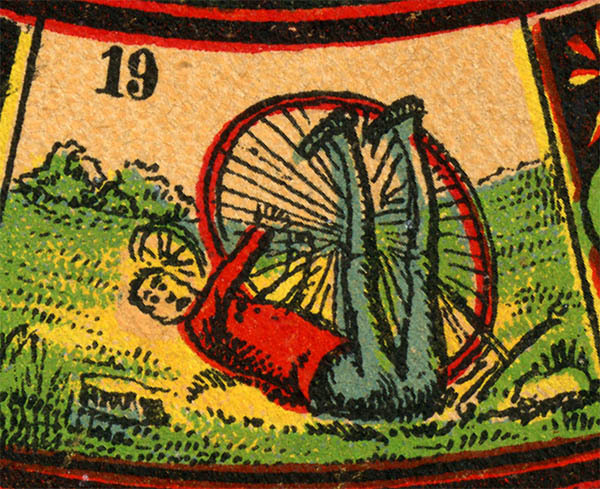 The dangers of the High Wheeler. As I said, there are no modern bikes on this board. 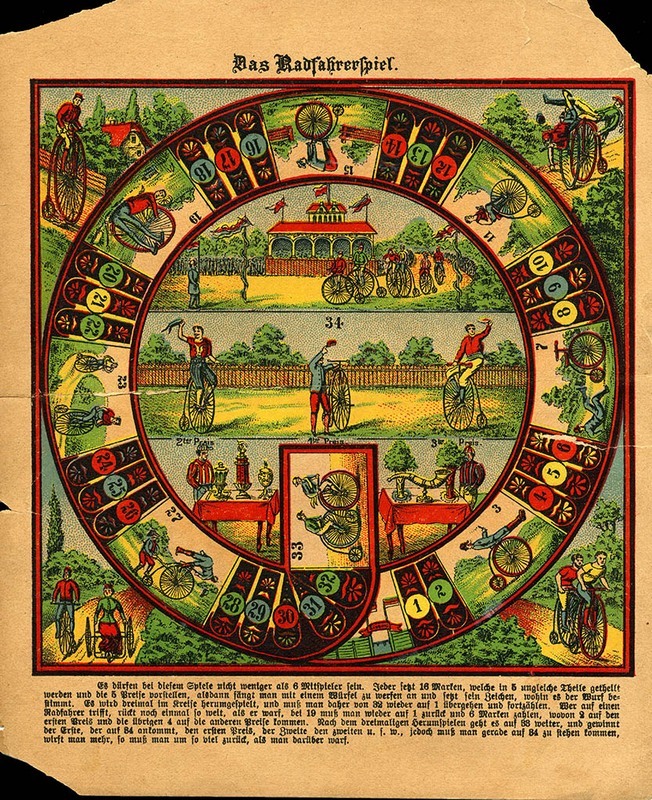 Compare to this other game, which is also interesting for bycicle historians. 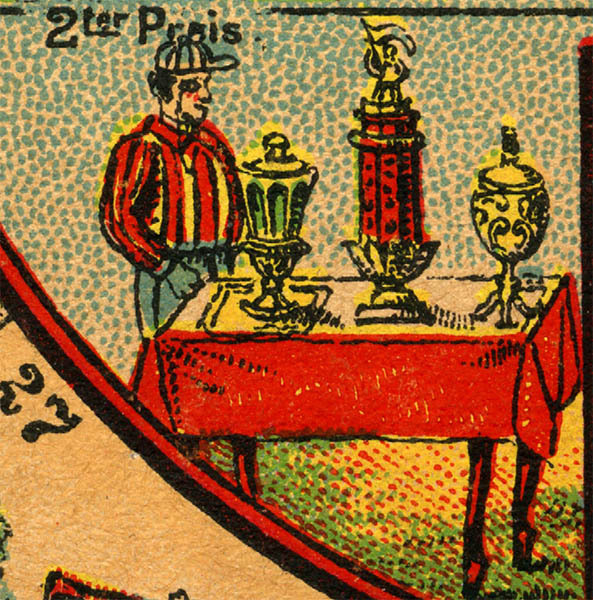 The prizes for the players. These are the other games that I found with this one. They are all of the same size and most probably belonged to the same booklet. Unfortunately they overall condition is not the best. 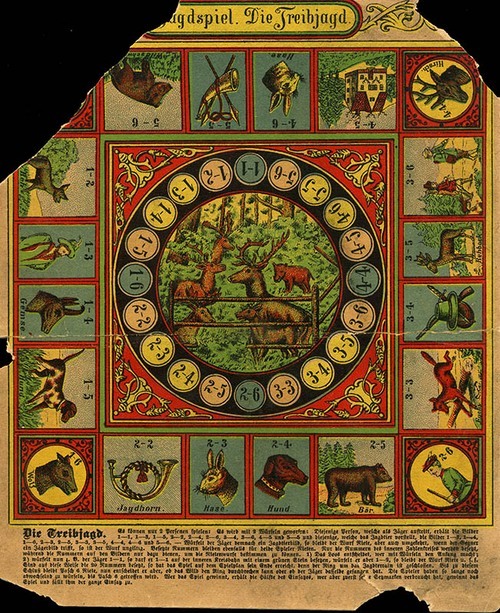 Apart from Das Radfahrerspiel, we find Das neue Affenspiel (the new game of the ape), Das Gansespiel (the game of goose), Jagdsp�el-Die Treibjagd (a fox-hunting game) and a nameless sheet with dominoes. 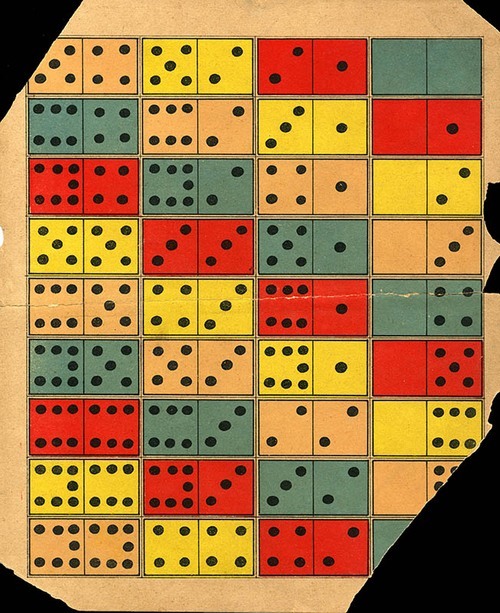 Notice that it is a rather unusual double-seven domino game. Thanks Stephen for the tip allowing me to find this game!